AUTHOR INFORMATION: Stephen Deas has worked as a systems designer and project manager for a number of technology-based aerospace companies and has reviewed books for the British SF Association's magazine Vactor. “The Adamantine Palace” is the author’s debut and the opening volume in a new fantasy series. PLOT SUMMARY: Once dragons ruled the world and man was little more than prey. Then a way of subduing the dragons alchemically was discovered and now the dragons are bred to be little more than mounts for knights and highly valued tokens in the diplomatic power-players that underpin the rule of the competing Realms. At the center of this empire likes the Adamantine Palace. And one Prince wants it for himself. A Prince prepared to charm, lie, betray, plot and murder to get what he wants. Nor is he alone in his ambition. Queen Shezira has her daughters and she means to use them as she herself was used, to gain the ultimate prize, marrying them off to secure her influence and power. All sell-sword Kemir is thinking of is money. Of freedom from the unending arrogance of the dragon riders. And maybe of a little cold revenge against the warlords who both need him and despise him. FORMAT/INFO: Page count is 384 pages divided over sixty-nine titled chapters and a Prologue & Epilogue. Narration is in the third-person via several different POVs of both major & minor characters including Prince Jehal, Queen Shezira, Speaker Hyram, sell-swords Sollos & Kemir, Scales Kailin, Snow, Master Huros, etc. “The Adamantine Palace” is the first book in a trilogy and does end on a few minor cliffhangers. The sequel, “King of the Crags”, is due for publication in 2010. 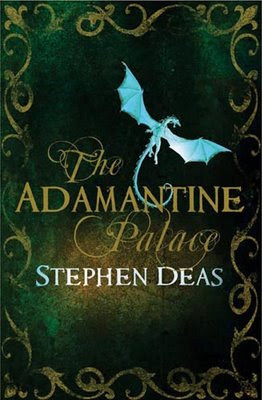 March 19, 2009 marks the UK Hardcover & Paperback Publication of “The Adamantine Palace” via Gollancz. “The Adamantine Palace” is an epic fantasy novel that combines old-school fantasy traits—think Terry Brooks, Margaret Weis, Tracy Hickman, etc.—with edgier, more contemporary ones. Of the former, the book is inundated with names and titles that could be straight out of Dungeons & Dragons—The City of Dragons, the Purple Spur, the Diamond Cascade Waterfalls, the Mirror Lakes, Fury River, the Plains of the Hungry Mountain, the Order of the Scales, the Worldspine, et cetera—while the author employs several familiar fantasy tropes including a medieval setting complete with kings, queens, princes, princesses and knights, not to mention the multiple third-person narratives, being part of a multi-volume series and of course, the dragons. On the flipside, “The Adamantine Palace” does mess around with a few time-honored conventions. Take for instance the dragons who, in a clear nod to Anne McCaffrey and Naomi Novik, are domesticated creatures ruled over by humans. As the novel progresses however, we learn that the only reason the dragons are tame are because of chemicals that suppress their intelligence and their memories of a time when dragons ruled the world. Factor in the Scales—people infected with the Hatchling Disease who are responsible for the care of dragons—the alchemists, their possible rebirth after death, and their burning hatred for humans, and it becomes clear that these dragons are not quite the same as those found on Pern or in Temeraire. Giving the book its edgier, more contemporary look meanwhile, are the characters and plot. At first glance, a cast of scheming princes and queens, over the hill kings, and money-hungry sell-swords may seem overly familiar, but Stephen does a great job of constantly surprising the reader. Main characters are killed off without warning, the villains are more likeable than the heroes, good guys become bad guys, and bit players suddenly become major ones. Admittedly, characterization is shallow compared to someone like Robin Hobb or Jacqueline Carey, but Jehal, Shezira, Snow and company are a fun bunch to follow. Pacing was the book’s most surprising quality with “The Adamantine Palace” moving at a breakneck rate from start to finish, punctuated by very short chapters. Personally, I found the rapid tempo to be a refreshing change of pace from the more long-winded fantasy series out there, but the world-building comes up noticeably short and is an area that needs work, particularly in regards to the Taiytakei, the alchemists, blood magic, the dragon-priests, Soul Dust, the King of the Crags, and the history/customs of the different Realms. Nice review, Robert. I might have to try importing this from Book Depository. Likely to buy this soon. Your review mirrors what I read elsewhere, not per se a truly top debut but interesting if lacking in worldbuilding.